I was gifted these chocolates by the company in order to review them. 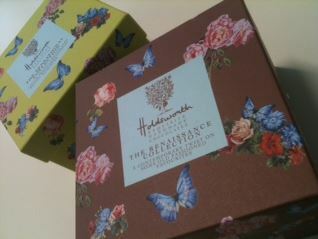 I have to admit that, despite Holdsworth Chocolates having been around since 1988, I had not yet encountered them. Mind you, I do have a blind spot for floral prints and so there is every possibility that I simply saw them and didn’t realise it. According to the flyer insert, printed on glossy paper and expertly folded to fit inside the thick cardboard box, Barbara Holdsworth started making chocolates in the heart of the English countryside in 1988. That’s not to say there is something wrong with the Scottish countryside which produced the award-winning Iain Burnett and William Curley, only that this was er simple geographic placement. Apparently Barbara was spurred on by a passionate belief in a handmade approach and desire for quality. The claim is that after 25 years they are one of the finest entirely handmade artisan chocolate producers in the UK. I suppose it is a very loose, and perhaps not common, definition of “entirely handmade” as I’m not sure where to draw the line, using a hand blender as I do in my brownie making (then again, I don’t sell them 😉 ) I happen to know a lot of chocolate producers in the UK, and quite a few of them have won a number of awards, something that isn’t clear from any of Holdsworth’s packaging or their website. Each of the boxes does not hold any duplicates and so it is absolutely not possible for me to review all the flavours. I’ve tried a few myself and I’ve asked for the help of my office colleagues to help me get an overall impression of the chocolates. I’m not a massive fan of this end of the chocolate spectrum but I know that a lot of the office are and so they were judge and jury on these chocolates. The box is sturdy and quite robust. 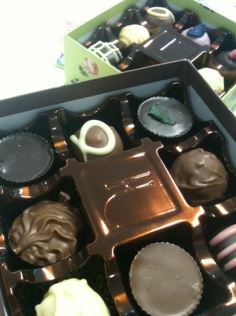 I think that after eating the chocolates it could be used for storing photos, recipes, trinkets or anything really. It is a wonderfully girly floral sturdy cardboard box and so could find reuse in a number of guises. The chocolates are presented simply enough but importantly they have the recipe guide printed both on the bottom of the box and on the insert paper. 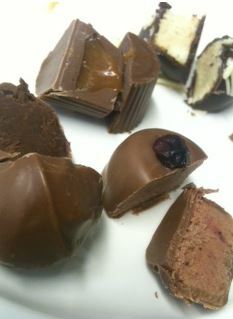 Before I accept the claim of *entirely* handmade chocolates, I would probably want to see the factory for myself. There is a lot of automation that goes into the chocolate making world and the line between handmade and not seems fine. The chocolates themselves are too sweet for me. I tried 4 of them and the whipped texture and sweetness was a bit too much for me. Even the lime in dark chocolate I tried was too much. The office gave me some interesting feedback: “I had a ‘strawberry cream’ one. very tasty.” (George), “Clotted cream truffle: Was a nice white chocolate truffle, but I could not taste the clotted cream” (Matthew), “Salted Caramel Cup, does what it says on the tin, the salt intensifies the chocolate, but you gotta be prepared for it!” (David), “Chocolate dipped fudge was nice – the fudge was chewy and not too course – you don’t get that sensation of eating pure sugar like you do with some homemade-style fudge” (Wayne), “Peppermint Cup is heavenly!” (Ryan), “Just tried a Orange Cream – The orange is zesty and fluffy and contrasts beautifully with the sweetness of the chocolate. Definitely recommended!” (George), “Lavender choc was nice (very creamy), but I couldn’t really taste much of the lavender… still yum though!” (Neil). All in all they are nice for a mass market, long shelf life chocolate. I’m a fan of the fresh truffle with its 2 week shelf life but I value the quality they represent. If you need a gift and these are handy, they will make a lovely one but they are just too sweet for me. 🙂 Glad you got to try them as well! Thanks for commenting!